This key allows retailers to offer consumers a simple, “do-it-yourself” solution for replacing modern car keys. 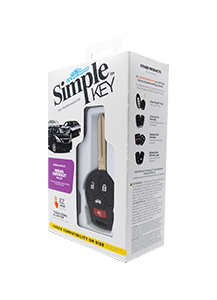 The consumer-friendly, self-contained product includes a universal key and an EZ Installer™, allowing customers to pair the key to their vehicle. Once cut, consumers follow simple instructions to pair the key in just a few minutes. This universal key controls the remote keyless entry systems for a variety of Nissan models. At the touch of a button, the key performs the same functions as the vehicle's original equipment, such as locking and unlocking doors, panic, opening the trunk, and remote start. Works on over 6 million vehicles from 2010-2017.